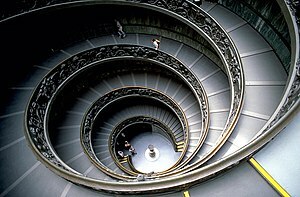 The Vatican Museums ( ), in Viale Vaticano in Rome , inside the Vatican City , are among the greatest museums in the world, since they display works from the immense collection built up by the Roman Catholic Church throughout the centuries. Pope Julius II founded the museums in the 16th century. The Sistine Chapel and the Stanze della Segnatura decorated by Raphael are on the visitor route through the Vatican Museums. As of 2007, they were visited by 4,310,083 people for the year. The Vatican Museums trace their origin to one marble sculpture, purchased 500 years ago. The sculpture of Laocoön, the priest who, according to Greek mythology, tried to convince the people of ancient Troy not to accept the Greeks' "gift" of a hollow horse, was discovered 14 January 1506, in a vineyard near the basilica of Santa Maria Maggiore in Rome . Pope Julius II sent Giuliano da Sangallo and Michelangelo Buonarroti, who were working at the Vatican, to examine the discovery. On their recommendation, the pope immediately purchased the sculpture from the vineyard owner. The pope put the sculpture of Laocoön and his sons in the grips of a sea serpent on public display at the Vatican exactly one month after its discovery. The collection was first housed in the Borgia Apartment, until Pope Pius XI ordered construction of a proper building. The designer was Luca Beltrami. The museum has many famous paintings such as Raphael's Transfiguration, Leonardo da Vinci's Saint Jerome, Caravaggio's Deposition from the cross and Perugino's Madonna and Child with Saints. The Collection of Modern Religious Art houses paintings and sculptures from artists like Carlo Carrà and Giorgio de Chirico. The group of museums includes several sculpture museums surrounding the Cortile del Belvedere . The New Wing, Braccio Nuovo built by Raphael Stern. Pope Clement XIV founded the Pio-Clementino Vatican museum in 1771, and originally it contained the Renaissance and antique works. The museum and collection were enlarged by Clement's successor Pius VI. Today, the museum houses works of Greek and Roman sculpture. Gallery of the Statues (Galleria delle Statue): as its name implies, holds various important statues, including Ariadne sleeping and Meander. It also contains the Barberini Candelabra. Cabinet of the Masks (Gabinetto delle Maschere): The name comes from the mosaic on the floor of the gallery, found in Villa Adriana, which shows ancient theater masks. Along the walls, several famous statues are shown including the Three Graces. Sala delle Muse: Houses the statue group of Apollo and the nine muses as well as statues by important ancient Greek sculptors. This museum is named after Pope Pius VII (whose last name was Chiaramonti before his election as pope), who founded it in the early 1800s. The museum consists of a large arched gallery in which sides are exhibited several statues, sarcophaguses and friezes. The New Wing, Braccio Nuovo built by Raphael Stern, houses important statues like The Prima Porta Augustus and The River Nile. Galeria Lapidaria is another part of Chiaramonti museum, with more than 3,000 stone tablets and inscriptions, which is the world's greatest collection of its kind. However, it is opened only by special permission, usually for reasons of study. Founded by Pope Gregory XIII in 1836, this museum has eight galleries and houses important Etruscan pieces, coming from archaeological excavations. The pieces include: vases, sarcophagus, bronzes and the Guglielmi Collection. Founded by Pope Gregory XVI, this museum houses a grand collection of Ancient Egyptian material. Such material includes papyruses, the Grassi Collection, animal mummies, and the famous Book of the Dead. The Gallery of Maps: topographical maps of the whole of Italy , painted on the walls by friar Ignazio Danti of Perugia, commissioned by Pope Gregory XIII (1572–1585).